Jestem w finale konkursu „Song of the Year” w USA!!!!!!!!!! 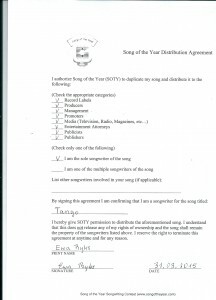 Hello Ewa, Thank you for contacting the Song of the Year songwriting competition http://www.songoftheyear.com ). You should have received an email from us last Thursday that let you know that you were a Finalist in the previous contest.